Luxury tents, boast en-suite ash toilet, twin washbowls and bucket shower. At 7m by 4m, they are large and contain twin beds with full mattresses, luggage racks, a hanging rail and shelving. Finally, each has mosquito netting, a bedside table for mosquito repellent and a battery-powered lamp. On arrival in Kasane your guide David Carson, who will guide you for the next 7 days in Chobe and Hwange, will meet you. 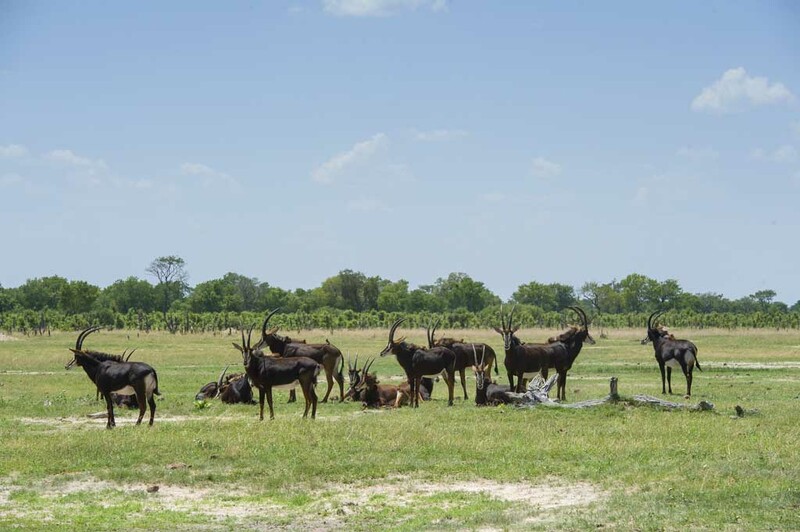 He will then take you into Chobe National Park – this is a game drive to camp along the flood plains, which is a wonderful introduction to the park and its inhabitants. Once in camp you will get to meet all the staff that will be hosting you and get acquainted with your new home for the next 3 nights. 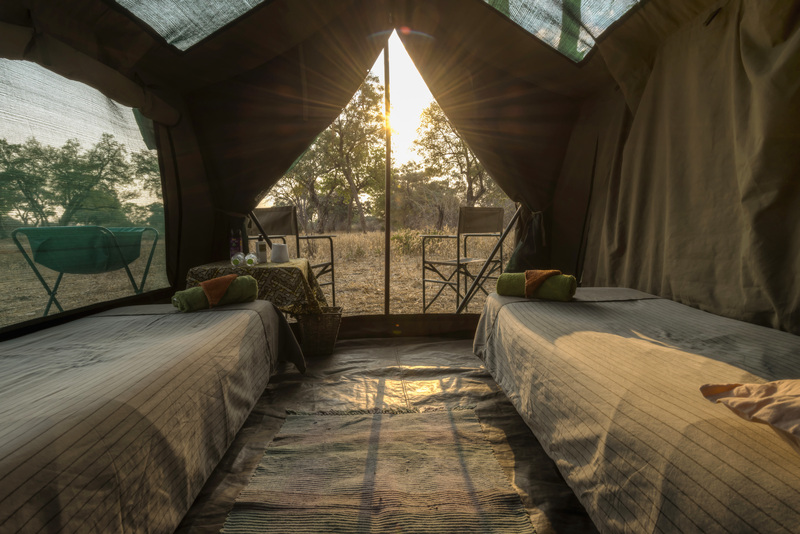 The accommodation is the same style in both parks and is in spacious insect proof walk-in tents with gauze-covered windows. The lighting inside the tents is bright enough to read by. Chobe is also famous for it’s huge herds of buffalo, the Chobe bushbuck, and for being the southern-most point where puku can be seen. The river serves as the main water source for the wildlife and birdlife in the area. The day will start as usual nice and early but instead of coming back to camp for lunch at midday, you will be taken to the boat station to do a 3-hour game cruise on the Chobe River. You will have packed lunch on the boat while you are on the river. This cruise is very scenic and can be one of the best for game viewing from the water. Today will be an early rise and game drive out of the park to the Zimbabwe border, where guests will do their border procedures. Once that is all done you will then proceed with your guide David in an air-conditioned bus to the gate into Hwange National Park, which is an approx 3-hour road journey. On arrival at the gate it is back into a game-viewing vehicle for a game drive to your campsite deep in the park. Lunch will be in camp, once everyone has seen the lay of the facilities, then a siesta and then finish off the day with a walking safari. On arrival back in camp in the evening the camp staff will have the camp fire going and it now that one gets the feeling of being in the wilds. 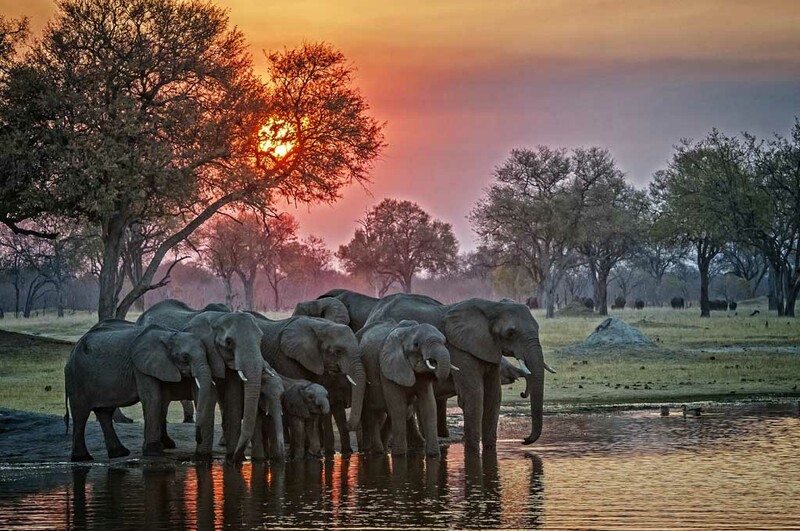 The Hwange National Park is 14 640km² and is in fact as big as Northern Ireland. Due to the vast size of the park the landscape varies from deep Kalahari sands in the south to rocky hilly country in the north. The park is divided into 3 different areas, namely Main Camp, Robins and Sinamatella areas. 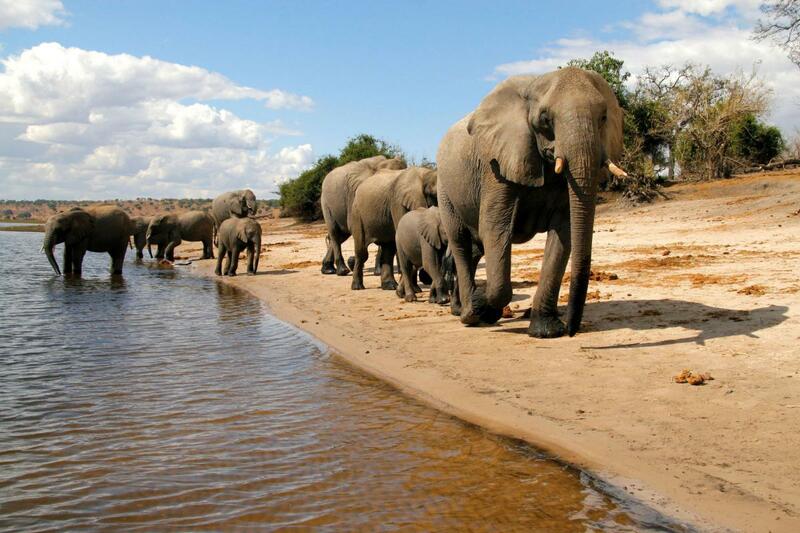 The park is home to over 35 000 elephants who in the dry season dominate all the water points in the afternoons. Other animals that can be seen in the park are lion, leopard, cheetah, rhino, buffalo, impala, kudu, sable, eland, waterbuck, zebra, giraffe, baboon and warthog. by vehicle or on foot or a combination of the two, this depending on what has been heard during the night. 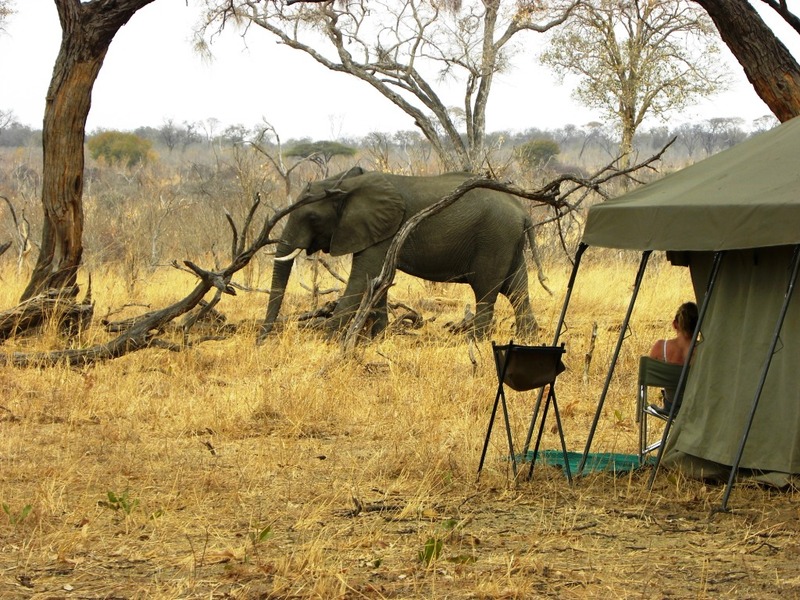 The walks are especially adventurous and you will always remember how exciting it is to be amongst the elephant on foot! Apart from the animals that you will encounter on foot this is truly a place that is wild and one definitely feels out in the wilderness. • The accommodation is in spacious insect proof walk-in tents with gauze-covered windows. • The lighting inside the tents is bright enough to read by, solar. • The ablutions are en-suite, consisting of an ash long drop toilet and hot water bucket showers. chores which include providing gourmet meals, tidy plus clean tents and all chores around the campsite. preferences so we can make sure we have plenty of these items! Toilets vary per area/trip between flush or ash long drop.